side dish – Damn Life is Good! 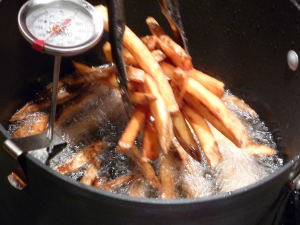 Is there anything more amazing than perfectly done French Fries? Golden brown and crispy on the outside and light and fluffy on the inside? It took a while, but we figured it out! Check it out! This is a recipe we adapted from The Purple Pig in Chicago. Easy and delicious! If beets are in season, go ahead and roast them and pickle them. Drain beets and let them dry on a paper towel. Whipped goat cheese with about 2 T cream until smooth. Add some salt and cracked pepper. Break pistachios into pieces with the flat side of a large knife. Toast them in a dry pan until they start to brown. Put beets in a bowl, add cheese then top with nuts. Served with Van Ruiten Pinot Grigio.